Beyond the Big Two: Praising Kurt Busiek's "Astro City"
Praising Kurt Busiek's "Astro City"
I turned 16 that same summer and remember the beautiful covers from Alex Ross and the talk about how awesome this miniseries was, how revolutionary and the like. Not that I didn't believe it, but this was about the time I had moved on from comics and was only really purchasing Frank Miller's work (300 and Sin City books). 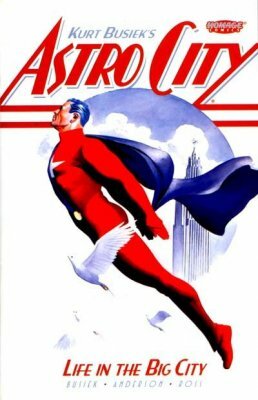 I may have been mature enough for Astro City, but by now, twenty-plus years, I'm certainly mature enough for it. I read the accompanying essays and got a feel for the premise: instead of the grim/gritty '80s, instead of the DADA-esque fracturing of the medium from Grant Morrison, instead of the "this is what the world where superheroes exist looks like" era, Busiek strove to look at the world where superheroes existed, for sure, but at the untold stories. Not hyper-realism, but more of a tweaking of the metaphor that caped superheroes personify. Brother: "Didn't you give me that?" Me: "I forget plenty of gifts, but this one specifically I know I didn't get you." Brother: "Really?...Oh you know, yeah...so a few years back I bought a huge collection of Stephen King's 'The Stand' in graphic novels, like a bunch of them, like over a hundred bucks worth. They threw that in for free. You can just have it...I'm not even sure I know where 'The Stand' is." This copy had a "Used: $3.99" sticker on it, so the store must have felt like they were doing someone a favor, because the collection is that good. The first issue/chapter follows the exemplar of Superman, here named The Samaritan, for oe complete day. It begins and ends with the Samaritan dreaming. In his dreams he flies. In reality he flies also, only from one person who needs to be saved to another. The day is presented as a series of flights to save lives, to meet with other heroes, to work to pretend to be getting articles written. Only he doesn't pretend---he actually gets work done. Throughout the day we see his grind. Eventually the editor comes to him with a super-secret dossier---here's a new juicy article to write. Excitedly the Samaritan scurries to get some privacy and take a closer look at the contents of the file. It turns out to be a list of the contestants of Astro City's newest beauty pageant. For one, the article is a crock, but for two, here this guy has the names and addresses of Astro City's 100 most beautiful women, 100 women who would likely love to meet and possibly even become romantically entangled with the Samaritan, but when would he ever have time for that? He laments the article on too many levels. As he heads home to sleep, he's attacked by a a recent iteration of a magical monster that feeds on fear and anxiety and tends to appear right as the Samaritan is about to pass out. During the pummeling he contemplates surviving this time, and if so, then what useful information could he give his super-group at the next meeting. He gets underneath the monster, which is his trap: he then flies straight up into space and throws it in the direction of the sun. Of course since it feeds on bad vibes, it disappears within fifty yards, making for an unsatisfying battle conclusion. The second chapter is a flashback anecdote about a rookie reporter trying to crack his first big story and working at a newspaper with journalistic integrity. The third chapter is about a two bit hood learning the identity of one of the masked superheroes and then diving himself nuts with the information, eventually leaving town with the secret intact. Everything is good and deep and real and new, which is the most important part. That it's new twenty-plus years on is a testament to how novel the approach is. I couldn't recommend this corner of the comic universe more.